If an email lands in an inbox and no one is around to read it, does it make an impact? According to data from over 6,000 salespeople using Yesware, the answer is “unlikely” — open rates dramatically decline after one hour, and less than 1% of business emails are opened after 24 hours. That’s why we’re excited to announce the addition of Send Later, a powerful new Yesware feature that lets you schedule emails for when they will be most effective and automatically sent at a later time from your Gmail inbox. Know that someone needs to relay your message in a 2pm meeting? Schedule your email to be sent a few minutes before and stay top of mind. Working with prospects or colleagues in different time zones? Write on your own time, we’ll send it on theirs. Send Later is currently available for Yesware Pro, Team and Enterprise users. 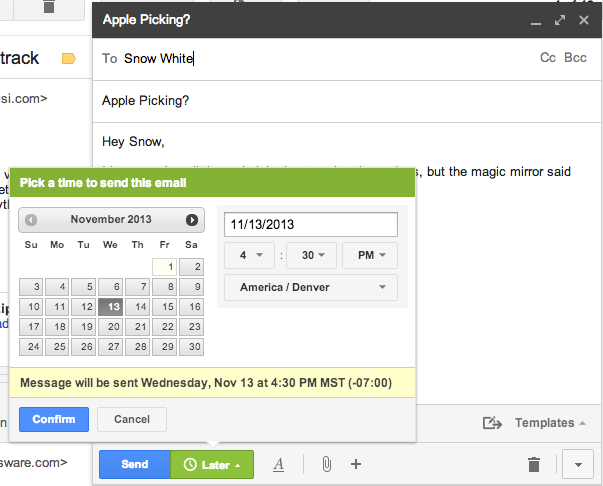 Simply draft your email as you normally would, then click the green Send Later button at the bottom of Gmail compose window to select a time and date. Pending messages can be viewed, edited, or deleted via the Scheduled tab in the Yesware dashboard. Check out this quick video to see Send Later in action. Last week also marked the roll out of a brand new Yesware dashboard, designed to help you quickly find the information that’s most relevant to you and how you work. Here’s a look at what’s new (hover for full details). What do you think? Does the new Dashboard help you effectively prioritize your followups? Thanks to the many of you who have already gone out of your way to offer us great and constructive feedback on the new releases. Keep it coming and stay tuned for future improvements in the months ahead.